Last year, I took a look at the cast of my books to see how well I was doing in representing women, people of color, and the LGBTQ community. I did this because I’d been reading a lot of articles and essays about how the entertainment media, in particular TV and movies, have been falling down on the job in giving audiences something other than stories featuring straight white male protagonists. If you Google “representation in media” or “diversity in media” you’ll find a treasure trove of data confirming that visual entertainment needs to seriously step up its game when it comes to giving audiences diverse characters. The issue has been on my mind again recently, but for a different and even more distasteful reason: reactions from what I’ll call “audiences of privilege” to efforts by some media companies to increase diversity. Specifically, some of the reactions to recent pushes by DC and Marvel to attract what can be rightfully called “non-traditional readers” — meaning women, people of color, and the LGBTQ community. This should be cause for celebration. Attracting new readers, people who might not have shown much interest before in comics because they found none of the current titles appealing, strengthens the industry with an infusion of new blood (and, not at all coincidentally, cash). Yet there’s been no small amount of push-back from the old boy community. They’re accused DC and Marvel of “pandering” to diverse audiences…because when you give, say, women more female characters and update their costumes to be less sexualized, that’s pandering to women, but keeping her in the same skintight leotard is, somehow, not pandering to men. Top: not pandering to men. Bottom: pandering to women. 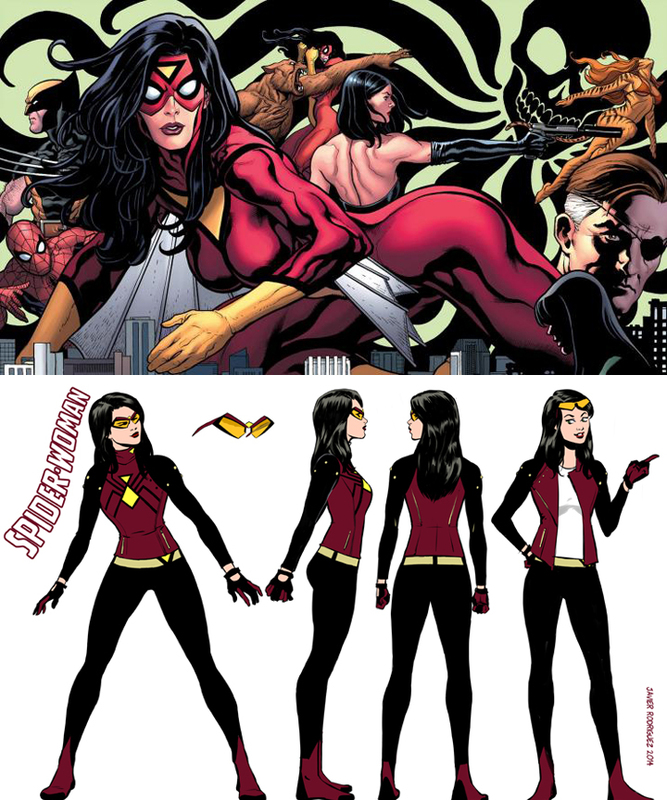 Art by Kris Anka and Frank Cho, respectively, images courtesy Marvel Comics. I received a little bit of push-back myself on Action Figures – Issue Four: Cruel Summer, which explicitly establishes certain characters as openly homo- or bisexual. A reviewer on Amazon said I was getting “too politically correct.” Hardly a scathing rebuke, but what does it say about any reader when adding diverse characters is succumbing to political correctness rather than endeavoring not to be mindful of the fact not everyone in the world is straight, white, and/or male? I admit, it took me a while to adjust my own thinking on this issue. I began the series open to creating diverse characters, but did so with the attitude that their diversity had to mean something. It had to matter to the character and the story. I didn’t want to simply throw in a bunch of diverse characters for the sake of it. Then I read a few things on Tumblr (which, for once, provided me with civil, sane discussion points rather than a profanity-laden, anger-driven rant) that opened my eyes. I can’t find the original post to quote it verbatim, but the argument was, essentially: why do diverse characters have to have a deeper reason to exist? Real people are different for no reason other than that’s how they are. Do you walk up to an African-American and demand they explain why they’re African-American, and challenge their right to exist if they can’t provide a satisfactory argument? The other post that made me rethink the way I approach storytelling stated that sometimes, simply seeing a diverse character in a story is enough. Giving the character depth and meaning is great, making their diversity meaningful is a lofty goal, but for some audience members, it is very gratifying and encouraging to see a character who is fleshed out, fully realized, isn’t a lazy stereotype, and matters to the story, and just happens to be someone of color, or just happens to be gay. I understand some of you might be rolling your eyes at all this because it none of this matters to you. Well, guess what? As William Shatner said, you’re not the only one living on this planet. It might not matter to you, but to someone else, it matters a lot, and frankly, I’d rather piss off someone who complains about diversity than someone who complains about the lack of it — because those in that latter category are right. I’d like to think I took some positive steps toward a more diverse cast with book four, and I’ll give you a head’s up now that the following updated cast list contains a few SPOILERS (capitalized to grab your attention! ), so if you haven’t read book four yet, you might want to stop reading now. I dare say I have the LGBTQ spectrum well covered, and I readily admit I am more comfortable presenting these kinds of characters because it’s what I’m familiar with. I know a lot of gay, lesbian, and bisexual people, at least one asexual individual, and one transgender person (that I am aware of, at least) through the renaissance faire community, and I encounter these people frequently at the pop culture conventions I work with my wife. Obviously, my failing continues to be in presenting people of color in prominent roles. There are many minor supporting characters of color, but few in any major spotlight role. Let’s see if I can correct that as I move forward with the series. It is your books and world, so write it as you feel you should do. I was not surprised or shocked by any ones sexual preferences That to me was not important to the story but It might be to others. All I can say is tell the stories you feel that you have to tell, Be responsible to the characters and stories they tell you. Oh, I am definitely someone who writes for myself first, but I like to be mindful of what might turn a given reader on or off. Not so much that it turns into “art by committee,” but it’s always in the back of my head. In this case, if someone is turned off by diverse characters, I’m not going to lose sleep about it. You know when i read TranSister I read Tranzister instead so I saw a power armored character and did not pick up on the transgender aspect, but I am Dyslectic anyway keep telling Lightstorms advemtuers…be blessed. I didn’t explicitly say she was transgender, yet, but she is. I’m hoping I’ll get a chance to bring Tranzsister in more with the next book, but we’ll see. And don’t worry, I have the next several books rough-plotted out, so there’s a lot more to Lightstorm to come! I know this is a bit later, but I just got around to reading Cruel Summer today. I thought Sara turning out to be gay was a nice twist which I felt explained why she didn’t explicitly turn down Matt more than anything else. But beyond that, I could care less if the characters were straight, gay, bi, or preferred the company of Angora Goats. Unless a characters sexuality is prevalent to the story, or to building that particular characters background (ie. said character being gay explains why she is freaking out so much about another woman being taken hostage and/or killed) then it shouldn’t matter what their personal choices are anymore than it should matter the color of their skin or their choice of gender. I feel like much of the community is either rabidly for or against writing non binary gender characters into their works to appease one group or another. And frankly, I don’t care for it. What should be written is the story the author wants to tell. If the story benefits from or needs a non straight white male character for example, then make that characters. Otherwise, who cares, they could all be Tribbles(Thank you Star Trek) for all I care. I just want to read an interesting story. And if what that takes if for every character to be an Androgyne, then so be it. In fact, I think the only peccadillo I had about the entire book was one little 2 word phrase. “Stop me” The cliched moment where a hero, despite being “too far gone” suddenly comes to their sense for no more than a moment, a figurative heartbeat, to gasp out an permissive moment for the hero so they don’t have to struggle with trying to rationalize attacking a friend/(that word I can’t think of that beings with a ‘c’) and will save the day. I mean, the salient point here(although no one ever said it in Cruel Summer) is “too far gone,” if you’re too far gone, then how do you take the time to stop and give permission to stop you? I could understand in a case of brainwashing, or possession, where the mind might fight through, or where your mind is clear but your body is not under your control. Although that last part raises the question, how then are you able to speak? But, if she was so far gone, as to attack one member of the team after another, including inflicting upon Stuart his darkest memory, then what is to make us believe that she would give permission as she is attempting to brain Carrie? Also, less an issue and more a question. I get that the big reveal to Matt on her gender preferences was good for where it happened in the book. But didn’t they have a debrief at some point before she woke up, where Carrie, Bart, and Edison delved into what happened, and how she ended up there, and why King of Pain went after her? Part of which would have included(and I believe did) the revelation of her sexuality? And wasn’t Matt there? I might have to go back and find the passage to reread it, but I thought they did and he was. Which is why it was a bit of a surprise when she sprung it on him. To answer the last questions you posed in the last paragraph, a debriefing scene was unnecessary. All that information had been provided to the reader elsewhere, and recapping it all would have been superfluous text that slowed the pacing while providing no new plot or character information. The issue of Sara’s sexuality, and when it was revealed to Matt, was a personal matter and not relevant to what happened with the King of Pain. It was Sara’s secret to divulge, and Carrie and Bart respected that.